From decadent dinner parties to foggy cobblestone streets, the world of the 19th century remains a place of superstition and mystery, where ancient legends mix with modern penny dreadfuls, and the most scientific minds still explore the spirit realm. Here the Kindred, long since banished to mere folklore, find themselves newly crowned celebrities, expressions of forbidden passion to a cultured world poised on the brink of a great transition. 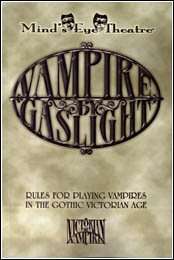 Vampire by Gaslight is the new historical setting for Minds Eye Theatre, based on Victorian Age: Vampire. Presented herein is all the material you need to play a vampire of this refined and distant era - the clans, their allies and enemies, as well as a wealth of information about the mortal world at the height of the Victorian Era and how the Kindred have come to claim it as their own.